My three favorite camellia bushes save their fireworks for the dead of winter. It is indeed a very special treat when these glossy-leaved shrubs start blooming in the greenhouse, their big beautiful flowers set off against the crisp white snow outside. Camellias are elegant evergreen shrubs that originated in China, Japan and Southeast Asia, and the remarkable thing about them is that they flower in the winter. While the leaves of some varieties of camellia are dried to produce tea, for many years breeders have also hybridized them, both within and across varieties, in search of better and bigger blooms. This has resulted in a bewildering number of cultivars with plenty of fancy names. Here in America camellias thrive in warm places with good rainfall and acidic soil, like the southern Appalachian mountains, and I began to wonder whether they might also do well in our Vermont greenhouse where, in the winter, we set the thermostat for 50°F (this counts as a ‘cool greenhouse’). So about 10 years ago I had a long chat with David, one of the owners of Camellia Forest Nursery in Chapel Hill, North Carolina, about the best varieties for growing under glass. The six plants I purchased from him have lived in our greenhouse ever since. 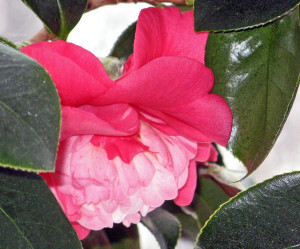 Three, all cultivars of Camellia sasanqua, are smallish shrubs (30 inches or so) growing in medium sized pots. These produce an abundance of smaller flowers in October and November, just as the garden outside is shutting down for the winter. The other three, all cultivars of Camellia japonica, are now good sized shrubs in very large pots. In December and January, when the sun is at its lowest and the days are their shortest, their stunning rose-formed flowers, up to 4 inches across, are nothing short of amazing. You can see how, if you are lucky enough to have a cool greenhouse, a few camellia plants can go a long way to bring mid-winter cheer to a snowbound gardener. Camellias grow naturally in areas with acidic soil and reasonable rainfall, so these are the conditions I try to replicate in the greenhouse. I have each shrub growing singly in its own pot in a peat-based potting soil. The pots are also large enough to accommodate the roots without crowding. For the summer months It is best to put your camellias in a partly shady spot. New flower buds that create the following winter’s display form during the summer, so it is important that watering is done deeply and regularlyduring the hot weather. I also have had good results when applying a cottonseed fertilizer plus some coffee grounds. 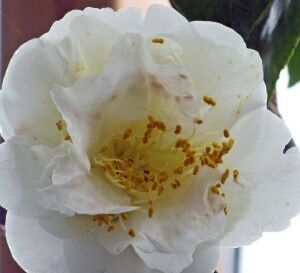 Camellias are also troubled by scale insects. Scale is quite difficult to eradicate completely. As a first line of defense I will scrape any invaders off the surfaces of the leaves and stems with a rag soaked in rubbing alcohol. I then follow this up by spraying the entire plant with ‘Sunspray’ horticultural oil (appropriately diluted), paying special attention to the undersides of the leaves.